Venus and Jupiter are leaving the evening sky, leaving Saturn as the only remaining naked-eye planet visible in the evening. This Saturday night, the Moon sidles up right next to Saturn, making it especially easy to find. The Cassini mission has been orbiting Saturn since 2004. It has not only been an incredibly productive scientific mission, but it has also sent back beautiful images of Saturn, its rings, and its moons. 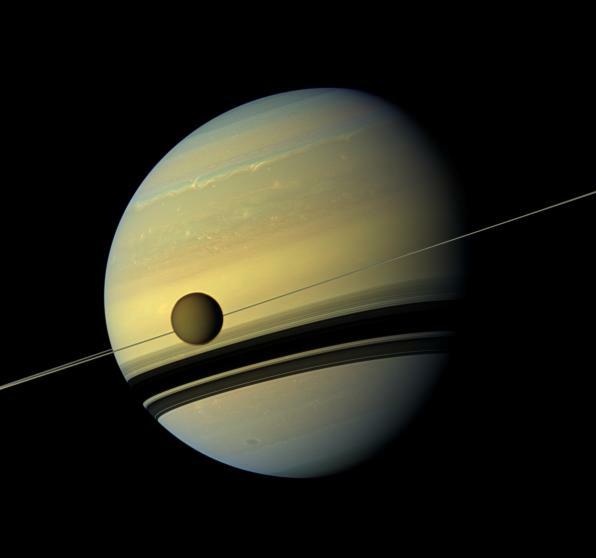 Below is an image of Saturn and Titan captured in 2012. A giant of a moon appears before a giant of a planet undergoing seasonal changes in this natural color view of Titan and Saturn from NASA’s Cassini spacecraft. – That’s a beautiful picture of Saturn & its moon! Wow!